These rubber tipped bamboo tongs are ideal for handling films during processing. 9"(L). These tongs have textured side panels which offer a firm grip and deeply notched "shoulders" which avoid slippage into the tray. The tongs are all plastic and chemically resistant. Tongs are color-coded in light and dark gray to help minimize the risk of cross-contamination. This ergonomically designed mixer is specially shaped for efficient stirring and incorporates a particle crusher. It is invaluable when making up solutions either from liquid concentrates or from dry powdered chemicals. The super System 4 is simpler to load, faster to fill, and easier to clean than any other tank. It has a large diameter one-piece lid and funnel, which clips into place positively and securely enabling the tank to be filled and emptied quickly. The Paterson 35mm tank takes a single 35mm film; the Paterson Universal tank takes two 35mm films or a single 120/220 film. Supplied complete with one 35mm/120/220 Auto Load Reel, Watertight EVA cap prevents leakage during inversion agitation. Uses less than 300 ml solution for a single 35mm film. Designed for use in the Paterson Super System 4 tank, the Auto Load Reel allows thru free flow of solutions. Paterson Reels have a smooth finish and use the unique twin ball ratchet system. Film loading just couldn't be easier! This filter may be disassembled and the filter reversed for flushing. 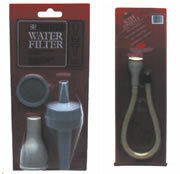 This 20 microns filter removes most water borne dust and dirt and it fits most modern tap sizes. Accommodates: Six of 4x5" (10.2x12.7cm) Kodak Hangers No. 4A - EMS Cat.#74332; or eight Kodak Sheet Film Developing Hangers No. 6 - EMS Cat.#74338. Fabricated acrylic racks that are designed to fit with developing tanks above. Sheet film is firmly held in the slots in the side rails while solution is freely circulating inside the tank. Catalog #74352 overall measurements 4 x 6 x 8"H (10.2 x 15.2 x 20 cm), holds 12 sheets of film 4x5" (10.2x12.7cm). 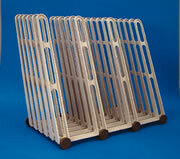 Fabricated from genuine Lucite®; these racks fit into our 5"x7" developing tanks (EMS Cat. #74343). One end of the rack is extended in length with a cut-out hole to serve as a handle. The racks are designed to accommodate a number of sheets per rack without changing the length of the rack (As the number of the films per rack increases, the space between them decreases). * Racks for 3-1/4 x4" (8.3x10.2cm) films or plates. Rack measures: 7-9/16" Lx3-3/8"W x 7-7/8"H (19.2cm x 8.5cm x 20cm). * Rack for 4x5" (10.2x12.7cm) films. Holds 12 of 4x5" film, fits into the 5x7" tank. The rack measures: 7-9/16" L x 4-3/32" W x 7-7/8" H (19.2x10.4x20cm). Laminated styrene developing trays. Wide cross bars and perimeter ribbing provide rigidity and easy cleaning. For storing chemicals that are air and light sensitive. Suitable for use with all photographic chemicals. As chemicals are used, Air-Evac can be compressed forcing out extraneous air from the bottle contents. Cap is then replaced for an air tight seal. Gracefully proportioned, molded pitchers with large comfortable handles, metric graduations and well designed pouring spouts. 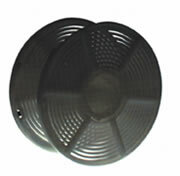 They resist heat to 175°C (374°F), are shatter-proof and have excellent chemical resistance. Ideal for preparation of photographic chemicals. New material specifications include up to 50% reused plastic. Polypropylene pitchers have unique lids with open spout to control liquid flow and built-in ice guard. Comfortable grip handle provides ease in handling and allows pitchers to be stackable. Water from 21 powerful jets runs constantly to separate and wash both sides of prints quickly and completely. Agitating water engages and dilutes the hypo, carrying it through the washer and out the opposite side quickly. The Rapid Print Washer accommodates 10 to 12 full-sized prints in one loading; all size films up to 11x14" (28x35.5cm). Internal measures: 13"x15½". The Major Print Washer is similar to the standard one, but with a larger capacity and a built-in siphon for convenient emptying after use. The Major holds 12-11x14" or 24-5x7" prints. * Note: For our international users: Standard and Major Print Washers will in fact accept prints to 10x12" (24x30cm) and 12x15" (30x28cm), respectively. Precision Dial Thermometer: easy to read Fahrenheit and Centigrade scales. Hermetically sealed; water proof; will not fog; made from corrosion resistant stainless steel. Comes with an adjustable positioning clamp. Accuracy to ½°. Model A comes with 1¾" dial with a 6" stem. Model B comes with 2½" luminescent dial with a 8" stem, ½° graduations and a calibration adjustment wrench. Fluorescent Scale in inches and centimeters. This metric/english plastic ruler is printed with a pink phosphorescent ink that glows in the dark. It is most useful for all fluorescent viewing and fluorescent photographic work. The scale will fluoresce visibly upon illumination with ultraviolet light and serves as a measure of nucleic acid mobility. The scale is 0 to 6" with 1/16" increments on one edge and 0 to 15 cm with 1mm increments on the other. Write on anything. Perfect for every photo. Will not wash off even on resin-coated paper. Comes with a convenient pocket clip and it is permanent, smudge proof, and waterproof. A stainless Steel Paper & Film Clip. Rust proof. Positive grip. Convenient for wall or wire hanging. The Clean Sweep Squeegee that out performs all other squeegees. Unbreakable handle, soft rubber blade, acid resistant, long life, scratch-free, lock in place. Ideal for applying window film. Made from rugged high impact styrene with a 4" long and 1" wide cellulose sponge. Easy to handle and it accommodates all films up to 4x5". Extra soft rubber blades and a unique floating-action lower blade pre-vents any damage to the print surface. Suitable for both RC and fiber-based papers. The Print Squeegee handles prints up to 16x20" (40x50cm). For air drying up to 20 RC prints in 15 min. Its compact design permits maximum ambient air circulation and prevents trapping of water between the print and the rack. The rack is also suitable for use with fiber-based paper. Print capacity: 5- 11x14"; 10-8x10"; 20-5x7". This RC Filter Flow Air Dryer means 5 minutes to perfect flat, and spotless RC prints or films. A built in Air Filter eliminates dust. It is thermostatically controlled for optimal drying temperatures.